As the MTA has worked over the last few decades to get its stations into shape, many Manhattan stations have undergone lavish overhauls while relatively fewer Outer Borough stations have been spruced up. With projects along the Brighton, Culver and Rockaway Lines, that trend has begun to shift in recent years, and now, Transit is going to blitz 29 stations in Brooklyn, Queens and the Bronx as part of a $455 million renewal project. As Pete Donohue reported earlier this week, Transit’s new Passenger Station Renewal Program will target a series of stations throughout the system that are suffering from neglect and is designed to improve components of these stations that are the worse. “The prioritization of stations in the ‘Renewal Program’ is based on a systemwide survey conducted by engineers who looked deeper than the usual signs of decay,” Donohue wrote. “They graded structural stability and other behind-the-tile conditions.” News of this component-based repair approach has been brewing since September of 2009. According to Transit, the following stations will be spruced up and repaired over the next four years: Hunters Point on the 7; Fresh Pond Road and Senca, Forest, Knickerbocker and Central Aves. on the M; 80th, 88th, 104th and 111th Sts. and Rockaway and Lefferts Blvds. along the A; Ditmas and 18th Aves., Bay Parkway and Avenues I, P, U and X on F; Sutter, Saratoga, Rockaway, Pennsylvania and Van Siclen Aves and Junius St. on 3; and Middletown Road and Buhre, Zerega and Castle Hill Aves. along the 6. One of the perks of being the majority party in the New York State Senate is the ability to appoint a representative to the MTA Capital Program Review Board, the committee tasked with overseeing and approving the MTA’s five-year capital proposals. Craig Johnson, a Democrat from Nassau County, had served on the CPRB for the past few years, and he emerged as a roadblock opposing the LIRR’s third track plan. Now that the Republicans are in the majority, Dean Skelos has appointed Brooklyn’s own Martin Golden to the CPRB. In the past, I’ve been skeptical of Golden’s statements on the MTA. He represents District 22, an odd mix of lower-density neighborhoods with high car ownership rates that also rely heavily on transit, and he is very good at taking non-stances on the MTA. He March he trumped the claim for more financial oversight, and in April, he protested the service cuts after failing to support the Ravitch Plan recommendations or congestion pricing. Meanwhile, Skelos and Golden are both saying the right things. “We need a strong voice on the MTA’s Capital Program Review Board who will work to control spending so we can use our resources to ensure the entire 12-county MTA service region has an affordable and dependable mass transit system for commuters and their families. I am confident that Senator Golden will work with the Mayor and others to keep the MTA moving forward,” Skelos said. Outside of the ceiling at the now-shuttered City Hall station which is actually a work of art, the ceilings of many New York City subway stations are works of art in the sarcastically metaphorical sense. With chipped paint peeling off the roofs and water stains cascading down from hidden orifices, the MTA’s ceilings do not inspire confidence in the system. If the authority can’t keep a fresh coat of paint on its stations, what exactly does that say about the way it maintains its system? Now, over the years, I’ve tackled the MTA’s paint job problems. In 2007, the MTA had plans to paint 200 stations in five years, but that plan was delayed because the authority couldn’t figure out how to decide which stations would go first. By 2008, these plans had ballooned into some comical scheme in which the MTA would paint just 12 stations a year, and it would take 39 years to outfit all 468 stations with new paint. The delay, the authority said, came about because of lead abatement problems, but the whole thing seemed to be a microcosm for MTA mismanagement. Flashfoward to today. We’re now a year into the MTA’s new component-based approach to subway repair, and the paint is still suffering. In his column yesterday, Daily News transit beat writer Pete Donohue tackled the saga of the ceilings. The MTA has a ceiling problem. He revisited the collapse in 2009 of the arched roof at 181st St. and notes that the ceilings at 168th St. have seen bits of plaster crumble onto the tracks. 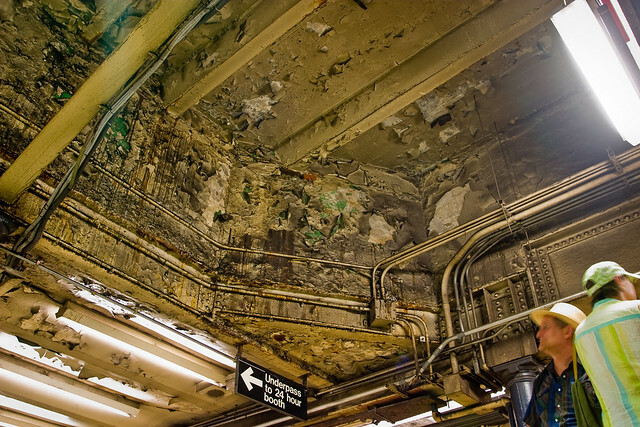 A major collapse may not be likely at 168th St., but signs that it has been decaying for decades abound: missing wall tiles, crumbling concrete, nauseating stains caused by leaks dating back to the 10-cent token. Tin, cone-shaped public address speakers – attached to exposed metal pipes above the platform – seem like relics from a WWII bunker. One ceiling leak is dealt with in a manner worthy of a Rube Goldberg award: A metal tray, suspended just below the ceiling, captures the water, which then flows down a pipe to another tray, then through another pipe that disappears into the ground near the rails. The problem is one of priorities and funding. The MTA must first invest its capital money into its track and signal system to make sure its trains are running smoothly and on schedule. No one wants to revisit the 1970s when track fires were a daily occurrence, and trains ran without electricity. The number one priority is and must be the parts of the system involved in actual transportation. But as the MTA invests heavily in its rolling stock and track, it doesn’t have the money or resources to devote to its stations. It can upgrade and rehab only a few stations every year, and those that miss the cut fall further and further into disrepair. The Chambers St. stop on the BMT Nassau St. line look as though it hasn’t gotten an upgrade since 1967 when the Chrystie Street work changed the station configuration, and it probably has indeed been that long. The renovated Times Square station might look better than it did, but even its paint work is showing the signs of age. West Fourth St. is a disaster unto itself. As Donohue writes, the authority’s component-based repair system is the right way to tackle a seeming monstrous task. Something as simple as a cosmetic upgrade at a station — brighter lightbulbs, a repaired staircase, a cleaner floor, fresh paint — will make the system more welcoming and more pleasant for its riders. People won’t be disgusted by their stations and might think of transit as something better than a hassle every morning. “Start with the roof, fellas,” Donohue says to the MTA, and why not? After all, most system roofs certainly need it. Look up at your own risk. These new signs will begin appearing in subway cars everywhere this weekend. The MTA enters 2011 in a bind. Public trust in the authority has all but vanished amidst another round of fare hikes and service cuts, and politicians find it to be an easy whipping boy for their own failures. Yet, the subways are, except when felled by the weather, moving forward, and to do that, the authority must go, hat in hand, to Albany to ask for a way to fill a $10 billion hole in its capital budget. That hole is not an insignificant one. As the MTA’s infrastructure inexorably continues to age, the authority has had to ramp up spending on non-revenue-generating maintenance projects. The Second Ave. Subway, for instance, is a traditional project that can be supported by construction bonds because the bonds can be issued off of guarantees of increased ridership and more fare revenue. Repainting a station ceiling and repairing a broken handrail do not lead to the same ridership and revenue increases. So the MTA needs that money, and the authority needs to prove that the money is going toward making the system more pleasant and more useful for everyone. Enter SubTalk. For nearly 20 years, SubTalk posters had been the voice of the subway, but they have been the voice of no. Don’t hold the doors. Don’t run on the staircase and platforms. Don’t lean over the platform edge. Don’t litter. The informative posters — such as an overly optimistic one about the Second Ave. Subway’s once-projected opening date — seem few and far between. The MTA insisting to me that the “Improving, Non-stop” rebranding “is not an image campaign, rather a better use of our internal space.” But even it were an image campaign, I can’t fault the authority for that. Amongst the blizzard and fare hikes, projects delayed and budgets exceeded, labor unrest and dwindling funds, the MTA doesn’t just seem as though it’s constantly under attack; it is constantly under attack. Oftentimes, those attacks are well deserved; other times they’re not. Yet, we cannot deny the economic reality of the situation: The $10 billion that the MTA needs for its capital budget is far more important than a few posterboards of poetry or inspirational quotes that, by and large, are ignored by most riders. If moving, as Fleuranges said to me, “away from the ‘House of No’ to ‘The Church of What’s Happening Now'” leads to some recognition of capital improvements and an eventual outlay of badly needed capital funds, I think we can sacrifice a few quotations by Abraham Lincoln or Henri Poincare for a few months. I’m sure there’s an app for that anyway. Can the construction industry save the MTA’s capital plan? When it comes to interest-group politics, the MTA’s likely allies often aren’t as supportive as they should be. The authority’s various labor groups spend more time fighting against the MTA than for it and seemingly refuse to recognize that a fully funded MTA would lead to more jobs for unionized workers. The construction industry too has been largely silent as project management and budgetary control have come under fire. Why would contractors, after all, want to attach their names publicly to infrastructure investments that aren’t on time and are routinely over budget? Now, though, the slumbering giant could be waking up. The construction industry in New York City has always leaned heavily on public investment and the state’s authorities for much of its work, and as the real estate economy is slow to rebound, the New York Building Congress’ future may depend upon the fate of the MTA’s five-year capital plan. In its latest New York Construction Outlook report, the NYBC anticipates a rebound in construction spending — but only as long as the MTA keeps doling out the dollars. A concerted effort must be made among all stakeholders, including the City, State, transit advocates and the building industry, to secure additional funding for the MTA’s capital plan. Potential vehicles include the long-delayed reauthorization of the federal surface transportation program and adoption of new sources of dedicated revenue, such as congestion pricing or East River bridge tolls. The New York Building Congress is, of course, a self-interested industry group, and its constituents want the MTA to have money because then they’ll get that money in return. We have to engage in the Faustian bargain of the supporting the people who are responsible for construction delays and engineering nightmares. Yet, we also can’t and shouldn’t discount the influence of the construction industry. The New York Building Congress is a potentially powerful ally for the MTA and transit advocates in the region. If they can reach the right people in state government and convince the right politicians to support the right projects, the MTA and transit riders throughout the region will stand to benefit. Politics might make strange bedfellows sometimes, and while I’d want the construction industry to better budget and plan its transit projects, without it, we might not have any capital transit projects at all. Noah Kazis was on hand to hear this bureaucrats argue for better funding, and the picture for every agency from New York City Transit to the Port Authority to the Department of Transportation is a dire one. “How reliable do you think that is?” Transit’s engineer Frederick Smith asked of the system’s 70-year-old signaling system. The MTA, of course, has funding for its current capital program for only two years and is struggling to maintain a state of good repair underground. Kazis’ piece explores some of the avenues available to the state that could generate revenue for transit. He mentions congestion pricing as a possible revenue stream, but with so many state authorities struggling to get by, the money generated by a pricing mechanism would be in high demand. Ensuring that the revenue from a New York City-based pricing scheme it goes toward improving New York City-based transit should be a primary concern for advocates. At the MTA, officials are focused on trimming the fat. Kazis reiterates how the MTA wants to reduce its operating budget by $750 million annually, but while those cost savings could hypothetically be transferred to the capital budget, as Hilary Ring, the MTA’s director of government affairs, said, those cost savings will generally work to avoid future service cuts and fare hikes as the MTA comes face-to-face with increasing debt payments. Without a serious commitment to cost reform from the construction industry, the state’s transportation infrastructure costs will continue to be prohibitively expensive. It shouldn’t cost $4-$5 billion to build two miles of the Second Ave. Subway, and yet, that price tag has remained too high for years. In its quest for more budget transparency, the MTA today unveiled an online dashboard that tracks the fiscal and physical progress of its various capital projects. Available online right here, the interactive tool allows members of the public to examine project proposals, budgets and schedules from the comfort of the web. The information will include every item in the 2010-2014 capital plan as well as some big-ticket projects from the 2005-2009 plan. When the dashboard is up and running, it will provide extensive details on the various capital projects, including milestones and year-by-year funding. Since the capital plan was, however, only recently approved and many projects are still in the planning stages, everything appears to be both on time and at budget. It is an MTA utopia of capital investment. What makes this tool particularly useful — as long as it’s regularly updated — is how it removes the mystery from the capital program. For example, let’s look at Transit’s plans for rolling stock purchases. We can see information for 123 A Division cars for the 7 line at a cost of $291 million; 290 B Division cars at a cost of $638 million; and 50 additional B Division cars for $110 million. Although the dashboard doesn’t offer up more information on these purchases, it provides a glimpse into the MTA’s plans. Similarly, we can glimpse at the $200 million plans for SmartCard installation and await a future free of the swipes of the MetroCard. For the MTA, this productive use of its website deserves a nod today. As ill-informed politicians continue to decry the MTA for being too opaque, the authority is using the tools at its disposal to combat those perceptions. The real test of its willingness to be forthcoming though will arrive as project budgets climb and timelines are delayed. As long as the MTA can easily admit that its work is lagging, it can begin to earn public and political trust. When last we saw the MTA’s 2010-2014 five-year capital plan, it had just been rejected by the state’s Capital Review Board with the lone and costly nay vote coming from Gov. David Paterson’s representative on the board. Today, authority CEO and Chairman Jay Walder reissued a revised draft of the five-year plan that has trimmed $1.8 billion from the initial requests and does not ask Albany for any additional funding right now. By and large, the big-ticket items and overall goals of this next five-year plan remain as they were this past fall. The MTA will still explore a Smart Card fare-payment system with a six-month pilot between the MTA, New Jersey Transit and the Port Authority set for this summer. (After all, as Walder said today, why should the MTA stick with the MetroCard, a 1980s technology, when most people don’t rely on anything from the 1980s at home or work any longer?) The agency will continue to refine and promote its component-based repair program while discarding with its unattainable state-of-good-repair approach. And, of course, the capital plan still has a funding gap that approaches nearly $10 billion. The authority, however, isn’t worried about the funding gap. The first two years of the capital plan are appropriated through last May’s Albany funding package, and Walder stressed that he will be more than willing to work with the city and state to find the money for the plan as the economy recovers. The revised plan, Walder explained to reporters this afternoon, has taken a four-pronged approach. First, the MTA has set forth a few money-saving provisions based around the idea of One MTA. To shore up capital investments, the authority is looking to see how it can share resources across subagencies. For example, a new repair plant at Harmon will service both Metro-North and Long Island Rail Road locomotives at significant cost savings for the MTA. “Are we making the best use of our physical plant?” Walder said the MTA asked while developing the revised plan. In the end, much of the plan remains the same (and you can find the Executive Summary of the revised proposal right here as a PDF). The authority will continue to work on the East Side Access project and Phase I of the Second Ave. Subway. It will continue to work toward ADA compliance, and it will explore designs for LIRR extensions. It will order more rolling stock and build out its bus rapid transit plans. But the authority knows it must convince the state the capital investment is vital to the future of the MTA, the city and the state. The new plan goes to the MTA Board on Wednesday for a vote, and a final draft will then be sent to the CPRB. The MTA says it will create 20,000 jobs for the state and generate $37 billion in economic activity. Hopefully, this time, the governor will approve, and investment in the system can continue. Gov. David Paterson, long threatening to block the MTA’s $28 billion five-year capital plan, has seen his wish come true. Stan Gee, the Governor’s one representative to the state’s capital review board, has voted against approval for the five-year campaign. Even though the other commissioners voted for the plan, the CRB is required to approve proposals unanimously. With its proposed Capital Program for 2010-2014, the MTA is finally making a true effort catch up with transit system innovation and technology from the 1970s. Earlier today, I examined the impending 2011 arrival of subway arrival boards. Now, we turn our attention to the surface streets and look at how the implementation of this technology is progressing for buses. Buses in New York, as long-time SAS readers know, have had a tortured history with this technology. The MTA had to abandon a pilot a short time ago when the technology, in place in various cities with tall buildings, could not handle Manhattan’s density and skyscrapers. While the authority is currently embroiled in a lawsuit over that failed bus tracking experiment, a new trial is in place along the 34th St. select bus service corridor, and this time, the agency feels that a wider roll-out is on the horizon. In fact, the latest Capital Program Q-and-A document — available here as a PDF — further explores the plans for the bus system. The explanation starts with a statement of commitment. “NYCT and MTA Bus are committed to pursuing an Automatic Vehicle Location (AVL) system, which will be used to provide automated real-time bus location and arrival information to bus customers,” the document promises. “This technology will be rolled out initially along existing and planned Select Bus Service (SBS) routes, with the eventual goal of providing real-time information on all bus lines.” All of the bus lines, however, won’t receive this service until the 2015-2019 capital plan. Currently, the MTA is testing out preexisting technologies. According to the report, the 34th St. corridor pilot is being fronted by technology from Clever Devices. This pilot is set to run through February 2010, and it comes “at no capital cost” to Transit. At the same time, the agency has issued a request for information to all AVL providers. “Extensive market outreach is also being conducted to identify all suppliers who can competitively provide this technology,” says the MTA. “The goal of this effort will be the development of specifications that can be successfully met by existing, proven and competitively available technologies.” In other words, why reinvent the wheel if the technology already exists? 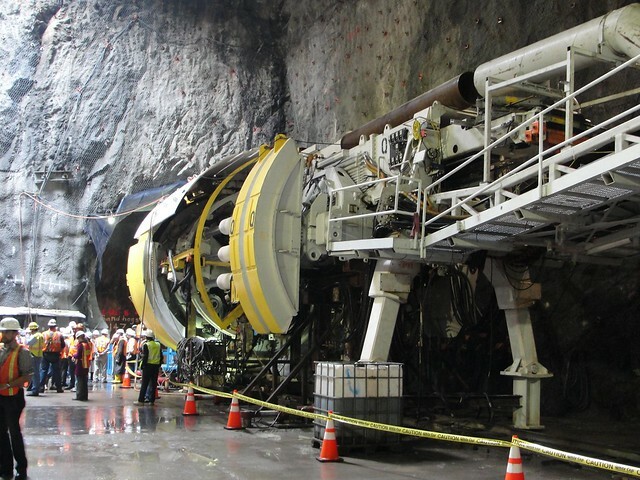 By 2010, the MTA will have its specifications in place to issue a request for proposals with a target date for the award of a contract by the end of next year. That contract, however, will cover select-bus service routes only for now including the First and Second Ave. corridors. The MTA plans to work with NYCDOT on both costs and implementation. As to the former, this is not a cheap system. The MTA has already received $30.7 million for AVL roll-out through the current capital plan and is asking for another $50 million in the next capital plan. A systemwide cost estimate for non-SBS routes is “not currently available,” but those costs will include a technological retrofit of the entire bus fleet. It won’t be a cheap investment. That is not to say that it shouldn’t be made. As the MTA notes, this is a necessary program, and one could argue that, as the respective implementation plans stand, the bus countdown clocks will be more useful than those underground. “AVL is expected to result in improved customer service by providing a comprehensive history of running time data that can be used to update bus schedules to better reflect actual conditions, resulting in more reliable service,” the MTA says. “AVL will also improve the ability to dispatch services, particularly in response to congestion or other unplanned events, resulting in a more efficient use of NYCT and MTA Bus resources.” A more efficient bus system would be a boon to New York’s transit infrastructure indeed.